In May 1985 an Australian woman and her husband working for the UN were kidnapped in Pakistan and held hostage. At some point during the months of search and negotiation the Australian Government flew the woman’s parents to the Afghan border and an area they believed the hostages to be. The helicopter touched down and the woman’s father stood looking out at the mountains. After a while he called, ‘Hello’. I thought about this call out into space after seeing Danae Valenza’s call-and-response work in North Melbourne. Valenza’s operetta reinterpreted Kyu Sakamoto’s 1961 pop hit ‘Ue o muite arukō‘. Also in 1985, the Japanese crooner was killed in the Japan Airlines Flight 123 crash, the largest ever single aircraft crash. It lends a cruel irony to the title of his hit single, translated as ‘I will walk looking up’ (and continuing, ‘so that the tears won’t fall’). 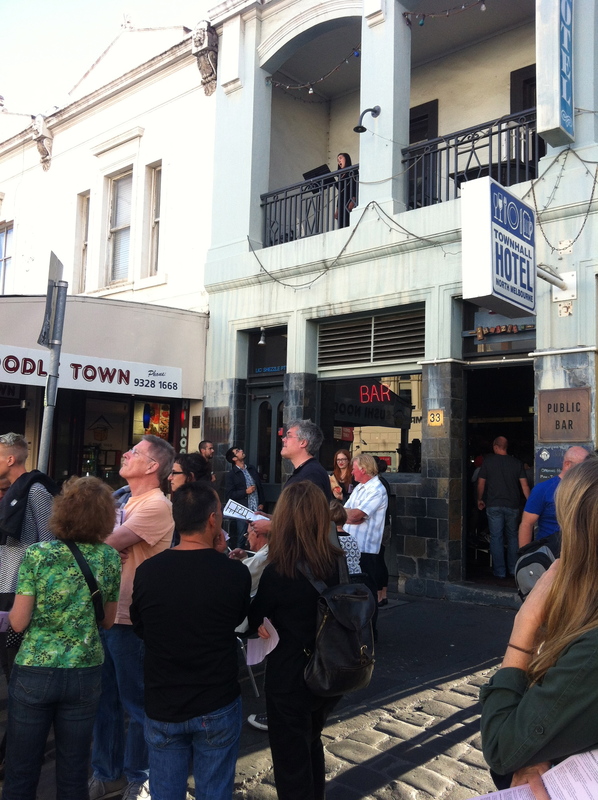 Two sopranos sung Valenza’s work to each other across Errol Street, one standing on the balcony of the Town Hall Hotel above regulars in the bar, and the other in an upstairs window of the opposite building. A cappella singing is hard to beat for a spine tingle. The unmediated medium—straight from the heart or at least the sternum. The simplicity of two people singing to each other went down easy in the quiet Saturday afternoon when most people in earshot were picking up some milk or putting on a load of washing at the laundromat. It might have been a background accompaniment to your steak Diane at the Town Hall or the reason for your visit to Errol Street. Valenza’s work was without presumption that it had something to teach or that you might be better off having heard it (‘benevolent’ public art is my pet hate). The inconsequentiality of a tune sung and the deep lightness of a pop song made this bit of public art poetic not pushy. This was the anti-declaration voice. The public intimacy of the voice was also in the reading of Fayen d’Evie’s text work ESSENTIAL MAKE-UP REPAIRS/I asked her if she had a favourite perfume and she replied ‘Chances, by Chanel’. An actress read the narrative to a packed front gallery at the opening of Can’t quite pin it down at TCB earlier in the month. The text recounts in third person the experiences of a transsexual woman over the course of many years and relationships while she becomes herself. In the context of an abstraction show, and one of all women, this narrative helped refocus what was happening on the TCB gallery walls—abstraction working hard to get out beyond the break of the easily known and the clearly defined. d’Evie’s text work spun gender and abstraction outward into wider fields. Danae Valenza, Operetta after Sakamoto, performed as part of Action/response: Falling, Dance Massive, 23 March 2013. Can’t quite pin it down (Fayen d’Evie, Suzie Idiens, Mia Kenway, Heidi Kozar, Fiona Morgan, Renne Jaeger), TCB, Melbourne, 6 – 24 March 2013.